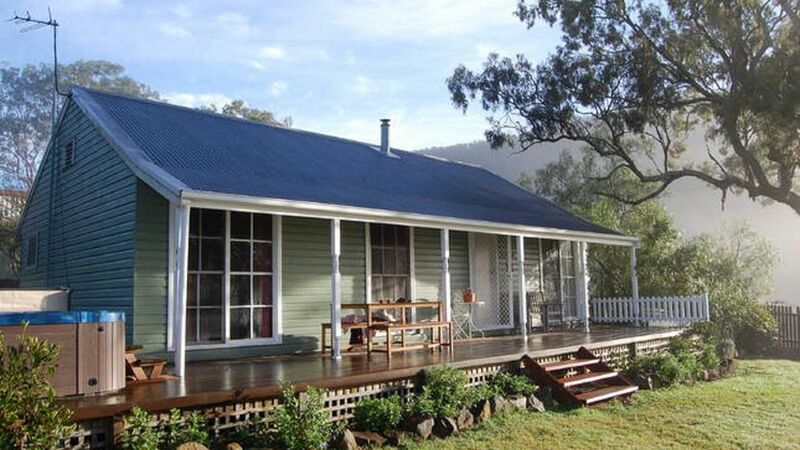 Cadair Cottage consists of two romantic luxury spa cottages in the Hunter Valley, NSW, AU. There are two identical and magically secluded cottages on 10 acres with magnificent valley views of the Hunter River. (Please also view Cadair Cottage 2 on Homeaway - property number 4847243 - the reviews against this cottage are legacy reviews from Stayz and refer to both cottages)Tastefully separate and secluded to ensure ultimate privacy for your stay, you can enjoy your complimentary bottle of Hunter Valley wine as you sit in the outdoor spa and soak up the views of the valley, or study the stars at night. The cottages are 15 minutes to the start of the vineyards. Each cottage has 2 bedrooms with queen size beds and one fold away bed (Available on request), sleeping a maximum of 5 people. The outdoor spa is absolutely luxurious and will ease away all the aches and stresses of modern day living. Towels and linen are provided. Minimum 2 night stay. Weekend price $600 for 2 people and $50 for each extra person per night. Weekdays $270 per couple and $50 for each extra person per night. All guests must be booked in at time of reservation. There is a minimum booking of two nights - three nights on long weekends and over Christmas. Stunning views, peaceful, and relaxing. Please - no smoking inside. Firewood is provided for the indoor fire from the beginning of May through to the end of September. 10 minutes drive from Maitland, and 15-20 mins from Lovedale and the heart of Wine Country. Scenic flights and ballooning are 10 minutes away. The historic craft and antique town of Morpeth is approx 20 mins drive, and The Barrington Tops National Park is approx 45 mins - 1hr away. Opera in the Vineyards and other events at Wyndham Estate, 20 mins away. As a very small and boutique business, late cancellations often result in empty cottages, which has a significant impact on our business. The booking and cancellations policies stated here, will apply in all situations. Guests are advised to take out comprehensive travel insurance to cater for any unforeseen circumstances. Please be aware of the Stayz terms and conditions of using the online payment system regarding loss of the full deposit if you cancel your booking. If less than 14 days, 100% of monies will be forfeited. If you do not arrive or stay for the entire number of nights that has been booked no refund will be given. Change of dates – must be made more than 30 days prior to arrival date. Date changes cannot be made within 30 days of arrival. All damages, including those inflicted by pets, must be paid for. It was private and tranquil; scenic lookout from the spa. Thank you for having us, Simone and Daniel. We thoroughly enjoyed ourselves at Cadair Cottage. The spa was a welcoming touch after a big day out where the temperatures were high!! At times, the spa almost felt too hot! Thank you also for the air-conditioner that was thoughtfully turned on on our arrival. We really enjoyed our stay and so did our little dog! Great fenced property for him! Great weekend getaway! Loved the views and overall feel of the cottage! Thank you for having us at your beautiful cottage. Stunning view, very clean and well-equiped. We thoroughly enjoyed soaking up the view in the spa with some local wine and keeping warm at night with the wood fire place. Our dog absolutely loved the fully fenced yard with lots of trees and gardens to sniff around and heaps of space for zoomies. We will definitely be returning to stay here for future holidays.